What next for Istanbul’s street animals? Nazli (aka Zehra) a portly stray who is a regular fixture on Istanbul’s Istiklal Caddesi. Recently I wrote about a feature of Istanbul life that I’ve always found fascinating: the city’s ‘sokak hayvanlari’ – street animals. I’ve been to many countries where strays are a feature of city life. Often these dogs roam the streets in packs and are wary of and aggressive towards humans. 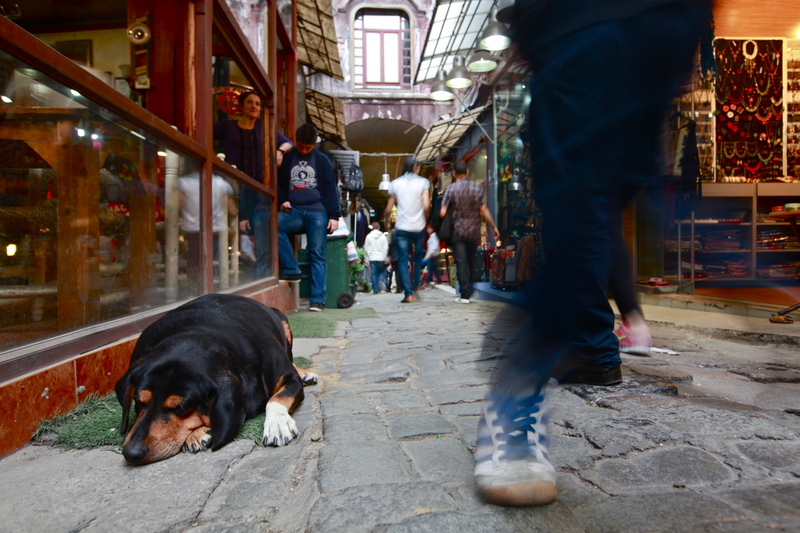 In Istanbul, however, the city’s strays struck me from the first as unusually well-socialized. Two big dogs caused chaos today when a pair of children unleashed them onto the streets. Deliriously, they ran biting at the tyres of every car that went past. The drivers slowed down, stopped, shouted at the children to control them, but the dogs rolled on down Susam Sokak, running at a car, jawing at the rubber with strangled barks, seeing another, running on, more barks. The children ran behind in joyous cahoots. I laughed. Around the corner an old fellow sat on a newspaper, his gnarled greying paws set carefully before him, head up, ears pricked, suffering eyes shining, looking intently toward the commotion. I’m living in a neighbourhood of animals and animal lovers: dogs, cats, pigeons, and küçük kumru, neat little doves with delicate brick-coloured breasts, English name: the Laughing Dove, Streptopelia senegalensis. The cats are often large, their bodies hanging off sharp shoulder blades. Some dart away as I walk past. Others stay perfectly still, eyes trained on mine, their heads tracking me with robotic precision. Some are tailless and seem to walk with the blithe assurance of dogs. Some hang around butchers and restaurants, sitting on the threshold, occasionally sprayed away with a water pump kept handy for this purpose. Many lie peacefully asleep on the seats of parked motorcycles, or on cars, stretched in the nook between the bonnet and windshield. For a few days a large yellow dog took up residence on my doorstep. A young girl would sit hunched next to him in her school uniform stroking his head diligently and mechanically, as if rehearsing instructions from a manual. He would sit there with the awkward, tolerant indifference with which dogs receive the attention of children. ‘Onun adı ne?’ I asked her once. Turning, smiling up at me, she exclaimed with warmth: ‘Pasha!’ as if she had been bursting to tell someone just this. Pasha was a very sad dog. I think he was turned out of the flat below me, perhaps because the weather was warming up. Someone put food out for him each evening, but every time I opened the main door, he would try to poke his nose in. At first he would wag his tail at me as if it was all some embarrassing mistake: he’d been locked out of his home, and could I please just help him back in? He began to look more dejected by the day. Sometimes when I was leaving the flat he would follow me down the street before getting sidetracked by a scent. He had a more cheerful friend who sometimes kept him company, and who appeared perfectly content with life on the street. Recently I saw that a small divot of flesh had been scooped from his head just above his right eye, and someone seemed to have put iodine on it (a fight with a cat perhaps?). I felt sorry for Pasha, and bought him some treats from a local pet shop. ‘Kedi köpek?’ (cat or dog?) asked the man as I entered. ‘Köpek,’ I replied, putting the biscuits on the counter, adding: ‘ama köpegim degil’ (but not my dog). ‘Street dog!’ he pronounced knowingly, as if there were nothing more natural in the world than to buy treats for a stray dog. Over the summer, animal rights activists have been protesting over a government plan that would allow these street dogs and cats to be rounded up and relocated to ‘natural habitat parks’ outside of cities where they would live out their lives, or could be adopted as pets. Opponents of the law claim the parks will in fact be ‘animal concentration camps’. I wrote stories on the issue for the Times and the Christian Science Monitor, looking at some of these street animals and the position they have in some communities. “Since the Ottoman times animals have been living in the streets and people have been sharing their lives with them,” said Tolga Sezgin, a photographer who cares for several street dogs. At his home on Burgazada, one of the Princes’ Islands, about an hour’s boat ride from Istanbul, a troop of well-fed dogs and cats attend the cafés and restaurant tables on the quayside. “They do not belong to anyone, but they also belong to all of us,” Mr Sezgin said. At his feet lay Artos, a huge hound whose story illustrates the fond relationship people here have with the island’s strays. Three months ago, when Artos broke his leg, 14 islanders raised 1,000TL (£345) for a complex operation to fix it. Mr Sezgin doubts that the Government’s proposed “habitat parks” will be the havens it claims. “They will immediately kill the old ones and the ones that require special attention, and they won’t take care of them, so they will start dying in big numbers,” he said. I think it says something significant and positive about the attitude of people here towards animals that a dog can live in the streets for years, exposed to the vagaries of human behaviour, and yet remain trusting and friendly. Of course, as with anywhere else in the world, people here can and do treat animals cruelly. Consider the case of Ebru, a street dog that lived in Taksim Square and who was allegedly kicked to death by drunken football fans in 2009. There is an article about it here. What strikes me about this incident, however, is that the death of a stray dog should attract the coverage of Turkey’s largest national newspapers, even – in this case – the state news agency. Incidents like this are commonplace in countries around the world. In very few places, however, are they national news, unless there are bizarre and unusual attending circumstances. On this score Turkey puts Britain – a self-professed nation of animal lovers – to shame. For me this boils down to the question of whether these animals should be on the streets at all, and if they should, to what degree should people be responsible for their wellbeing? Ironically, the view adopted both by the government and the army of animal rights activists lead to the same conclusion: these animals should not be on the street. In the view of many animal rights activists, the illness and injuries of these dogs and cats are a moral crime perpetrated by Turkish society. If you take that view, it is simply not possible to cater for the needs of tens of thousands of strays. The only solution is to neuter them out of existence or find them owners. The older mentality, that was once widespread throughout Europe, is that humans have diminished or little responsibility for these animals, or that communities share those responsibilities to some degree. This view holds that dogs do not need to be ‘owned’, and can be tolerated as long as they do not pose a threat to the communities they inhabit. The assumption that now dominates Western culture and which runs through much of the writing on this subject, is that dogs and cats should be pets, and that their owners have total responsibility for their care. In Turkey, the older mentality survives to some extent. This helps us understand why some Turks release their pet dogs and cats onto the streets when they get bored of them – the culture of pet ownership and responsibility is not well-engrained here. In creating cities – vast man-made environments that are hostile to most other species – humans have created a new ecological niche open for exploitation by those creatures that have the intelligence or ability to do so. The story of dogs is the story of one species’ (the wolf) extraordinarily successful exploitation of a new ecological niche created by another species (us). Wolves, archaeological evidence suggests, were among the first animals to benefit from humanity’s runaway success. The domestication of wolves (around 15,000 years ago) most scientific studies agree, occurred around the same time that the human population was undergoing an explosion and was moving towards a more settled lifestyle. While we tend to assume that dogs evolved from wolves as a consequence of direct human intervention, some of the most recent studies on the issue (I recently read an academic work on the origins of dogs, v recommended) suggest that the early steps of this process may have been a two-way affair. The advent of the trash dump – a byproduct of humanity’s sedentary lifestyle and success at feeding itself – created an obvious food source for wolves that were able to suppress their flight reaction/aggression towards humans. These were the prototypes of the first dogs. Their relationship to humans may have been similar to that of today’s street dogs. What I’m getting at is this: while I accept that Istanbul’s street animals probably will disappear, eliminated out of kindness or public health concerns, I think it will be a shame. We are denying a population’s right to exist because we have humanized it to the extent that we feel morally culpable for its wellbeing. We would not do the same with a wholly wild animal or with the pigeons and doves that have made a home in our cities with just as much success. Maybe this is extreme. I accept that in a city of 16m people, the presence of a population of 150,000 stray dogs and cats presents significant public health risks. Also, the suffering of these animals, particularly at the places where they are dumped outside the city by municipal authorities, must be very considerable. Another thing to consider is that these dogs and cats present an ongoing burden in the sense that authorities and charities already neuter them in an effort simply to keep the population at or below its current level. Perhaps we are responsible for them, whether we like it or not. If and when the ‘sokak hayvanlari’ do go, however, I’ll miss them, and the richness and drama they add to Istanbul’s street life.